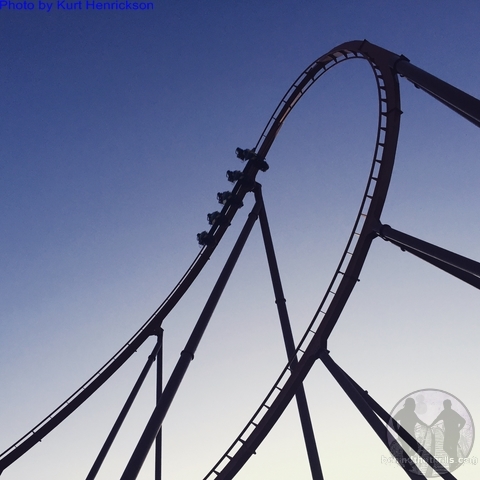 Behind The Thrills | Holiday World launches America’s first launched wing rider coaster-Thunderbird! 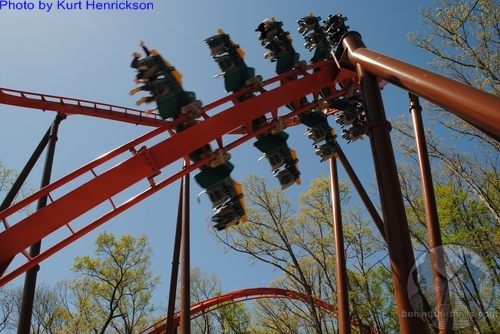 Holiday World launches America’s first launched wing rider coaster-Thunderbird! 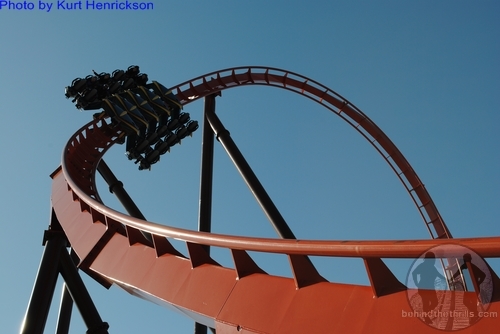 Holiday World launches America’s first launched wing rider coaster-Thunderbird! 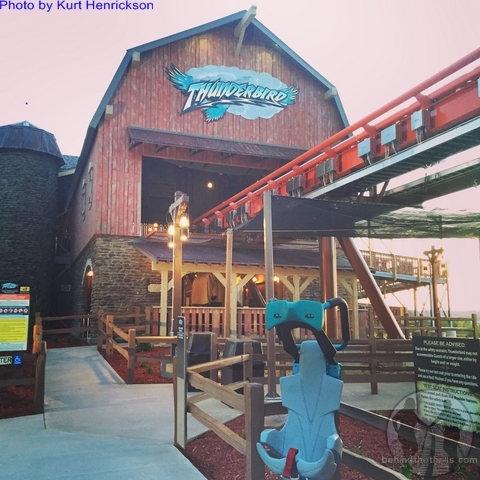 Thunderbird at Holiday World is a huge step for the little theme park in Indiana. It marks the fourth major coaster, and the first major steel coaster in the park. It’s the first coaster in the park to take riders upside down, and it’s also America’s first launched wing rider coaster. That’s a pretty big deal for not just Holiday World, but for the coaster manufacturer, B&M as well. The coaster made it’s official debut Thursday for media, and other select groups before the park opened for the season on Saturday. 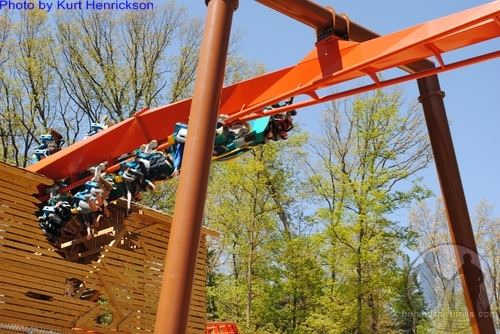 Before the media and other riders were able to launch through the woods on Thunderbird, the park held an opening ceremony, along with a group of riders who bid to be the first riders ever on Thunderbird. The money raised went to Give Kids The World in Orlando, a group that helps kids with life threatening illnesses, by giving them an escape. Leah Koch, and sister Lauren were on hand to talk about the new coaster, and exactly what it meant to the park and to them. “Do you believe that a little park in the middle of a corn field in Indiana has done all of this?” said Leah Koch. 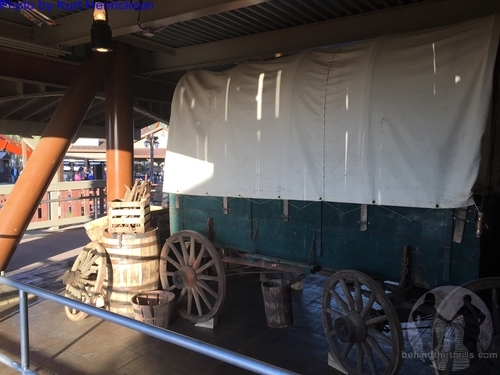 The new area is in the Thanksgiving section of the park, and takes on a decidedly “pilgrim” feel, with many of the props, and themeing elements playing out a story that first started online. 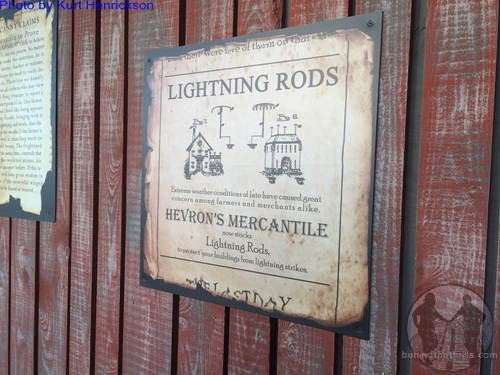 The queue is full of wagons, and signs, showcasing the “history” of the area. 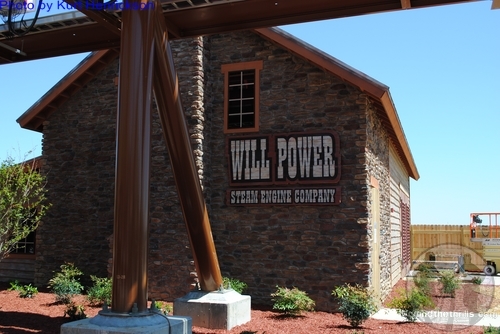 There’s even little nods to longtime park owner and president, Will Koch, who passed away before seeing a big steel coaster built in the park. The queue begins the story that culminates in a ride on the legendary Thunderbird of Native American Culture. According to the story, in 1620, as the Mayflower neared the end of its 66 days at sea, a mighty storm nearly capsized the ship, taking it hundreds of miles off course. As passengers and crew feared all was lost, an immense bird appeared in the sky. The thunderbird, whose wings created the thunder and eyes flashed the lightning of the powerful storm, rescued the ship by launching it through the sky to the New World. The park is a traditional family park, with several big family themed attractions. While many might have feared that Thunderbird is a departure from that family element, and is a sign that the park is seeking a more thrill seeking fan based, that couldn’t be further from the truth. In fact, that park has spent the past few years adding attractions that the entire family could enjoy, and the addition of Thunderbird is yet another one of those additions. While the coaster does have a 52 inch height requirement to ride, and it does blast from 0-60mph, it’s still a fun ride that all ages can enjoy. It’s also a way for the park to bring in more for families of all ages. While other parks have installed Wing Rider coasters, Thunderbird is unique in that it uses the landscape. It hugs in and out of trees, in some spots hugging the natural terrain of the park. The design elements of the coaster are also uniquely Holiday World, using things like barns to go through instead of big metal keyholes. 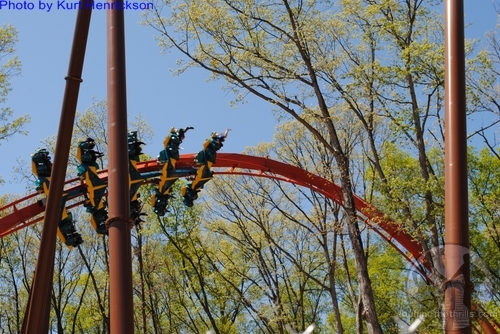 It winds through turns, inversions and loops smoothly, and quietly as the bird soars through the forest. It also incorporates the other attractions in the area, having near misses with the park’s signature wooden coaster, The Voyage. The ride marks the biggest single investment in Holiday World History, but it’s definitely not going to be the last. The park has hit on their hands with Thunderbird, and is likely to build on that in the coming years. In fact, we were told that it we could see a major new attraction as early as 2017. There’s a reason the countdown was started at five…a new major coaster would mark Holiday World’s fifth major coaster. Now, the only question is what exactly it would be. Slideshow-Check out even more pictures from Holiday World! Stay tuned for more from Holiday World, and be sure to get social with us on Facebook, and follow along with us on Twitter @BehindThrills for the latest updates! The Incredible Hulk coaster is reborn at Universal Orlando! The Muppets are coming to Magic Kingdom this fall in an all new show!